Occasionally – sadly – locomotives have suffered severe accident damage very early on in their working life. 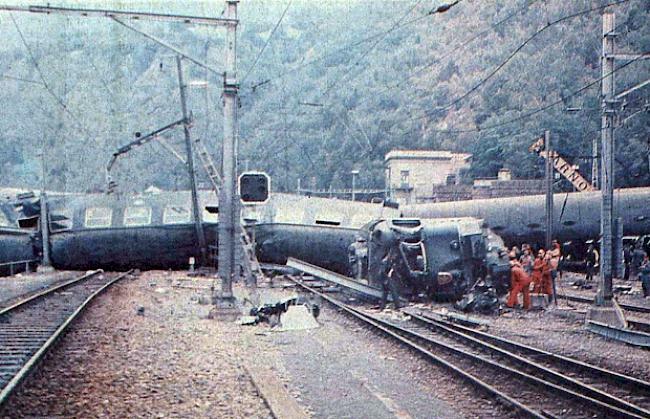 One such machine was Swiss electric loco 11640, one of the 10,700 hp class Re6/6, which derailed at Brig in the early hours of 23rd July 1976, just four months and four days after being accepted into traffic. This was the first serious incident involving a loco of this type, the production fleet of which had only started to enter service less than a year before. 11640 was hauling the “Riviera Express”, a Ventimiglia to Amsterdam and København overnight train, which in the 1970s was booked to run via the Simplon Tunnel into Switzerland in the Summer months (but via the Gotthard route in Winter). The brand new loco, and its driver, took over the nine-coach train at the Italian frontier station of Domodossola just after midnight and set off north. 11640 would certainly not have had any difficulty getting such a lightweight train up to speed! Shortly afterwards, it entered what was at the time the longest railway tunnel in the world – the 12-mile-long Simplon Tunnel deep beneath the Alps. It was not to emerge unscathed. As the train left the tunnel, at 00:50, the loco and front carriages were already off the rails and came to rest scattered all over the track in the Swiss darkness. Of the 131 people on board the train, 6 were dead (including the 34-year-old driver) and 34 were injured. It is believed that the driver had become disorientated within the tunnel and had failed to brake for the speed restriction on the tight curve coming out of the tunnel at Brig, which was taken at approximately 140 km/h. 11640 derailed first, scraping the tunnel wall, which did in fact keep it relatively upright. However, as it left the confines of the tunnel, it did then tip over onto its side, with the carriages following into it at speed and causing a scene of devastation. One of the carriages was even left teetering over the edge of a steep embankment above the river. One especially tragic tale of the accident relates how a 26-year-old Danish woman and her two infant children travelling home on the train had elected to move to an empty compartment in order to have a quieter journey. All three perished, but the occupants of their “booked” compartment were able to walk away. However, the fact that the death toll was not much higher was due in large part to the quick response of volunteer helpers rushing to the scene to help the rescue efforts. It took only 45 minutes to evacuate all survivors from the wreckage and get them en route to the hospitals in Brig and Visp, despite the darkness and heavy rain. It always seems trivial to talk about the fate of locomotives following accidents that have claimed lives, but 11640 did have an interesting story. Its bodyshell was virtually destroyed in the accident (click this link to see a photo of it at the accident site). Presumably due to it being brand new, it was not actually written off – Re6/6s were still very much in production at the time – they were in fact only delivered up to 11642 by then – and so a new bodyshell was constructed for 11640 and the loco re-entered traffic in 1978, with the same running number but with a new works number. 11640 was in the wars again nearly four decades later, when it collided with 11620 whilst shunting around St Maurice station on the morning of 23rd October 2014. Both were damaged, but whereas 11620 was written off and scrapped, 11640 was repaired and re-entered service in April 2016. At the time of writing, in 2018, 11640 – now numbered 620 040 – remains in traffic, with SBB Cargo. Next time you see it whilst travelling through Switzerland, do take a second to think about the accident that befell it early in its career and the six people who died.